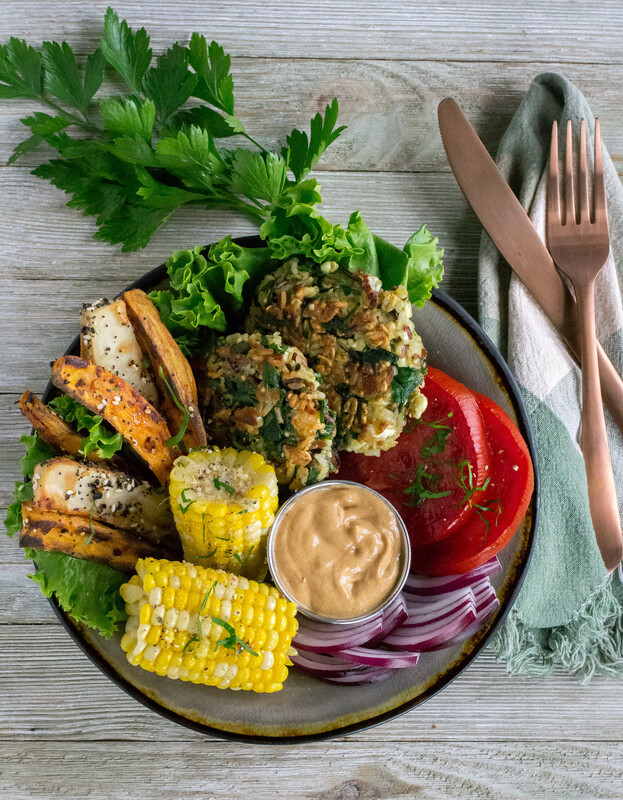 Veggie Burger & Fries Buddha Bowl - What the Forks for Dinner? Then toppings are added…..veggies…sliced or diced, a protein….lean meat, and a drizzle of sauce. History has it that the Buddha Bowl originated with Buddha carrying his bowl through roads wherever he was staying. Local folks would place food in his bowl, whatever they could afford to share as a donation. He would eat whatever he was given. Buddha Bowls are up to your interpretation. I know thats pretty vague, but they are really whatever you have on hand. Thats the beauty….you can customize it to your taste and use up all those leftovers. 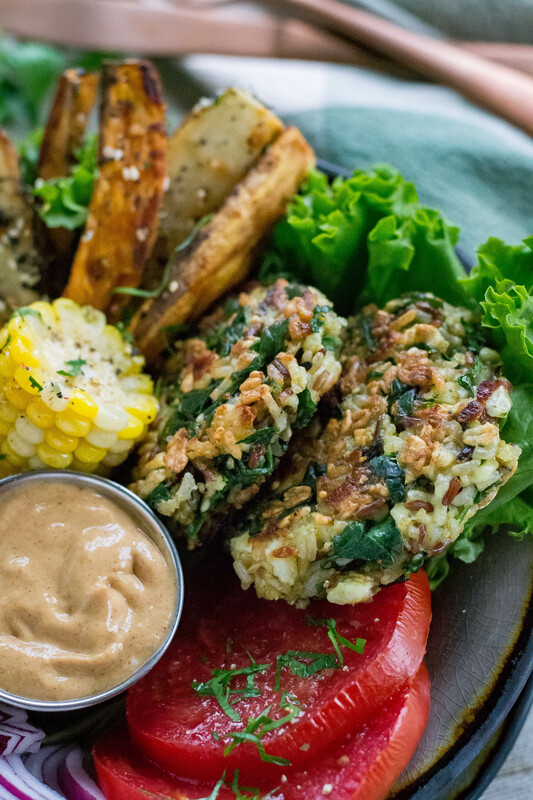 Burger and fries are a classic combo and Veggie Burger & Fries Buddha Bowl is a vegetarian take on that classic. 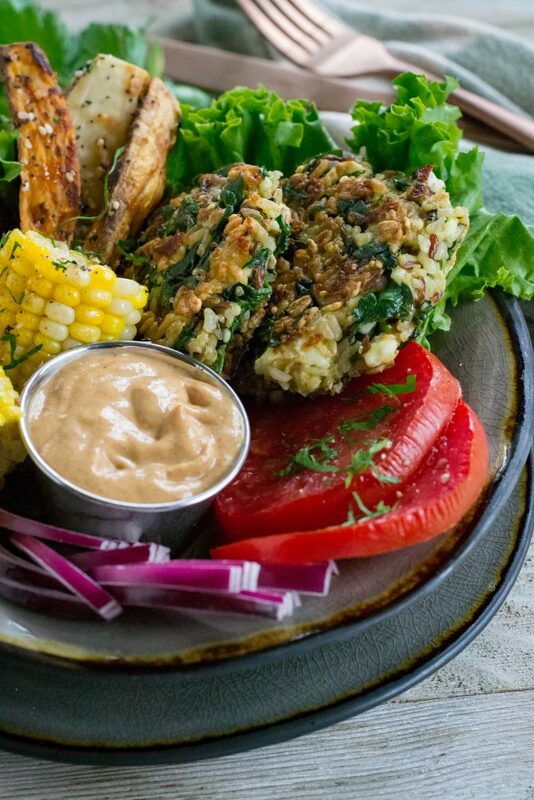 Burgers made from a rice quinoa blend…….Minute Rice makes one that is my new fave. Cooks in 10 minutes. A mix of brown, red, and wild rice with quinoa……it’s delicious……and no I am not getting paid to say that….it is just that good. Feta cheese, spinach, eggs, and oatmeal are added to the rice blend, then allowed to set in the fridge for about a half an hour. This helps firm up the mixture, making shaping the patties easier. Spray your hands with some cooking spray to keep the mixture from sticking to your hands. Fry the patties in avocado oil until golden brown. French fries are a burgers side kick, but fries can be greasy and unhealthy. Bake them. Potatoes, either russet or sweet, tossed with a small amount of oil and seasoning make a perfect revamped french fry. I used everything bagel seasoning…delicious! 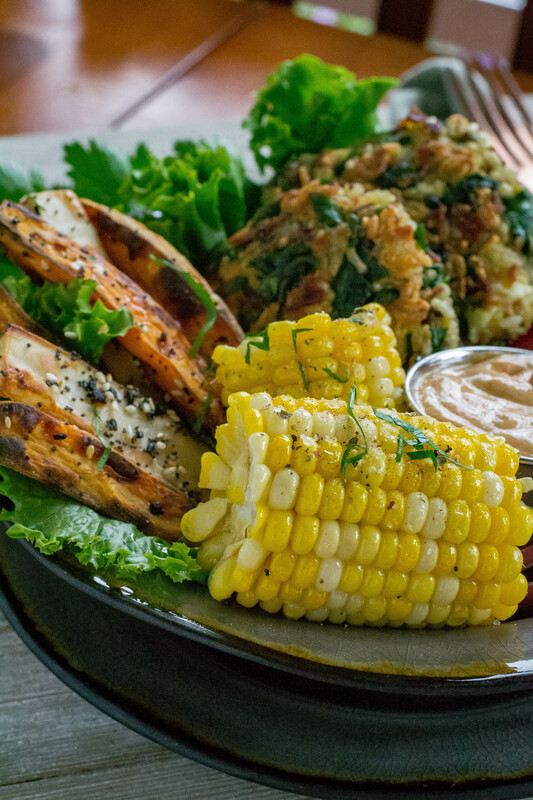 The end of summer has arrived, but there is still sweet corn to be had, and whats better to go with a burger and fries, but corn on the cob. Corn cut into mini cobs…perfect! 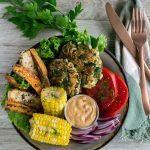 Leaf lettuce lined bowls, topped with the burgers, fries, mini corn cobs, garnished with tomato, and red onion makes a healthy, colorful burger and fries bowl. Now about that sauce…….mix greek yogurt with BBQ sauce, mustard, ketchup, a touch of pickle juice…..all those things you put on top of a burger in a sauce form. Smoked paprika adds a mild smoky aroma and flavor, just that little something extra to take this bowl over the top. 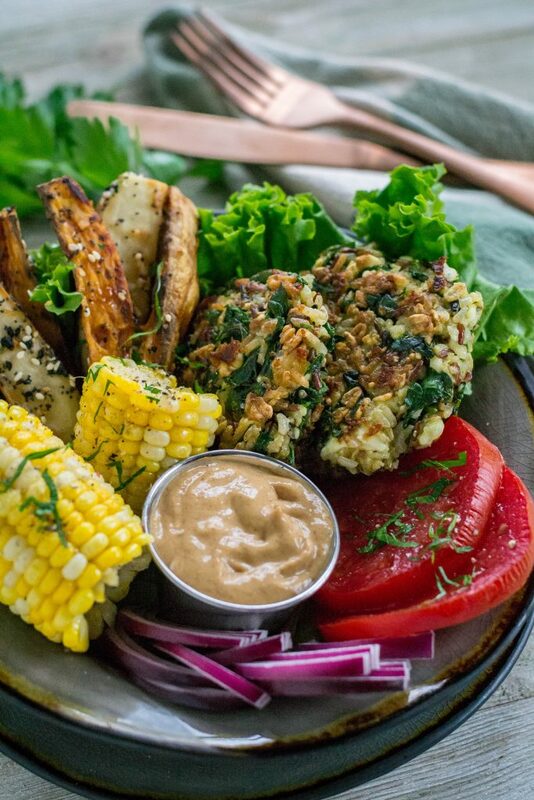 Jump on the trend…….Veggie Burger & Fries Buddha Bowl, is a healthy, colorful, version of burger and fries!! Healthy spin on burger and fries! In a large mixing bowl, place cooked rice quinoa, oatmeal, eggs, feta cheese, chopped spinach, salt and pepper and combine until mixed well. Place in the refrigerator for 30 minutes. This allow the mixture to firm up and makes it easier to forth patties. Remove mixture from refrigerator form into 6 patties. Spray hands with a non stick cooking spray to keep mixture from sticking to your hands. Heat the avocado oil in a skillet over medium heat. Fry the patties about 2-3 minutes on each side or until golden brown. Place potato wedges, avocado oil, and seasoning into a ziplock plastic bag. Seal bag and toss wedges to coat with oil and seasoning. Spread the coated wedges on a cookie sheet. Bake wedges in preheated oven for 30-45 minutes or until golden and slightly crispy. Line the bowl of your choice with leaf lettuce. Place burger sauce in a small cup. Arrange the burgers, potato wedges, tomato, onion, and corn inside the bowl and serve.